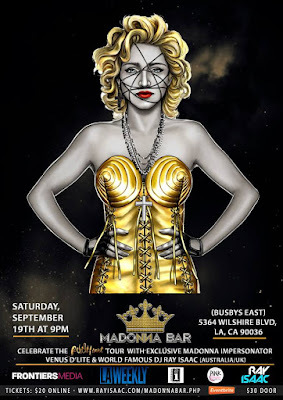 International DJ RAY ISAAC has announced the official debut of MADONNA BAR Los Angeles in September. The highly-anticipated event, which launched last year in Sydney Australia, is said to commemorate the pop icon. In a statement to herald the upcoming engagement, RAY ISAAC said, “Madonna BAR is the premium experience”. RAY, a pop singer, songwriter, and DJ will be hosting the exclusive event. Ray goes on to say, “This is a monthly event especially for the die hard Madonna family as we pay tribute to her music and how she has impacted our lives”. Recording artist Sir Ivan will host his annual Hamptons extravaganza to celebrate the success of his latest Billboard hit, Kiss All The Bullies Goodbye, produced by Paul Oakenfold and featuring Taylor Dayne. The event dubbed Sir Ivan’s Royal Tea Dance will take place on Saturday, August 22nd at Sir Ivan’s Castle and recreate the ambiance of Studio 54, the iconic New York nightclub where every night, a mixed LGBT and heterosexual crowd danced in harmony. The Castle (below) will glow in rainbow colored LED lights for the special occasion, just like the White House did when gay marriage was made legal. Guests will be dressed as one of the Village People, a musical group that best symbolizes the party theme of diversity, acceptance and love.